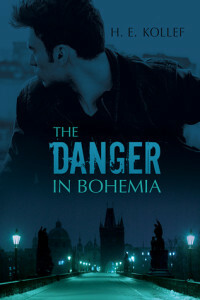 Will Mracek is forced to flee to Prague when he witnesses his boyfriend, powerful security magnate Jean Claude la Bête, commit murder. On the run, and with help from his cousin John, Will becomes an English teacher named Max Knight and does everything he can to blend in. Meeting Hadrian Walls, however, changes everything. Max falls in love with the grumpy ex-RAF, now bartender, and Hadrian finds himself doing the same, despite not knowing the secrets of Max’s dangerous past. This book had a great premise. It sounded intriguing and had both romance and some mystery in it. Max is running – running for his life and worried that he’s put himself and those he cares about in harms way. However, the only thing he can do is to keep living. While I wouldn’t characterize his demeanor as meek, he certainly is not outgoing or even a little bit rough. He keeps his head down and lets his life kind of pass him by. Then, he meets Hadrian. Things change for Max after this, but it was not a very large change. Subtle changes that help Max feel more comfortable in his life. Hadrian is kind of like a bull in a china shop when it comes to his life. You get hints of his past, but nothing super concrete. He is gentle with Max because he can see something haunts him. However, he knows what he wants and he wants Max. Finally, you have John, Max’s cousin. He’s an odd character in this story, but I really enjoyed how protective he was of Max. Overall, this was a story that could have been great, but kind of diminished in its delivery. It was hastily thrown together and you somehow end up with a nice bow at the end. H. E. Kollef is an author and aspiring librarian. She was born in New Jersey, spent her early twenties writing and teaching English in the Czech Republic and Korea, and is currently attempting an MSc in Library Science in the UK. It is possible that she was bitten by a peculiar bug as a child, one that encouraged wandering feet and a tumbling mind. Her favorite city is Prague and she recommends it to everyone she meets, especially if she thinks they’d enjoy romance, hearty beer, and snowy walks along the winding Vltava river. Her latest project is H. E.’s first foray into the world of romance novels; it is a contemporary thriller; there are explosions. You can learn more about it, along with her previously published work, at HannahKollef.com.